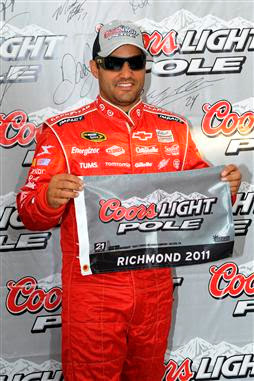 Into the late stage of Friday afternoon qualifying for the NASCAR Sprint Cup race at Richmond International Raceway, Juan Pablo Montoya captured his 2nd pole position of 2011. Wheeling his Earnhardt-Ganassi Racing's #42 Chevrolet around the 0.75-mile short oval in 20.989 seconds, Montoya outpaced the Furniture Row #78 Chevy of Regan Smith by roughly 14/100ths of a second. On the second row is the Richard Childress Racing #33 of Clint Bowyer accompanied with the #4 Toyota of Kasey Kahne. Mark Martin in the #5 Chevrolet rounds out the top-5 for the 400-mile event. The time trials for the CROWN ROYAL Presents The Matthew & Daniel Hansen 400 at Richmond was highly beneficial to Chevrolet teams. Five of the top-six qualifers for Saturday night's event were Chevrolet Impalas with the Red Bull Toyota of Kasey Kahne becoming the only non-General Motors team to break into the grouping. Chevrolet vehicles had dominated the Richmond short track from 2006 to 2008 until the recent success of Joe Gibbs Racing-fielded Toyota Camrys. For the past two spring races at Richmond International Raceway, Kyle Busch celebrated in victory lane. Busch will start 20th on Saturday night with his teammate Denny Hamlin starting 11th. Winning late summer events at the track in 2009 and 2010, Hamlin was also won the Friday night NASCAR Nationwide Series event at Richmond. The CROWN ROYAL Presents The Matthew & Daniel Hansen 400 starts at 7:30 pm Eastern time on Saturday night. Did Not Qualify: # 92 Brian Keselowski #.